A full BREEAM New Construction 2011 assessment is undertaken in four to five stages (depending on when the assessor is appointed), comprising registration, pre-assessment, initial guidance/design stage assessment, construction and post construction review /final certification. It is essential to ensure that the scheme is appropriately registered with the BRE. This is done by completing and returning the registration checklist. Once registered, the scheme is then protected from future changes and updates to the scheme. This stage is undertaken by design teams wanting to establish a realistic baseline for a development from which they can explore the options available to enhance its performance. Pre-assessments are normally undertaken for funding, planning or viability purposes and are generally undertaken as early as possible in the design process, before the design and servicing options have been confirmed. The process starts with the assessor meeting with the design team to talk through the BREEAM criteria and to develop a score based on commitments made in the meeting and using any other information available at that time. This meeting can take 2-3 hours. After the meeting the design team will be given a period of time to review the commitments made in the meeting and to respond to the assessor with any further comments or information. After this point, and with the rating agreed, the assessor will complete and issue the pre-assessment report. The Pre-assessment report is designed to show how, based on the information and commitments provided, the development is capable of achieving a certain score/rating and to provide information with regards to the next steps of the BREEAM assessment process. The Design and Procurement (D&P) assessment is the first official stage in the BREEAM assessment process and is undertaken for the majority of BREEAM projects. A D&P assessment should be started as early as possible in the design stage in order to ensure that the development picks up as many credits as possible in the most pragmatic and cost effective way. The first stage in the D&P assessment process is for the assessor to meet with the design team in order to establish an ‘agreed’ list of credits to be pursued which will enable the required rating to be achieved. This meeting can take between 2 and 3 hours. After the design team meeting, the assessor will prepare a guidance report which will detail the performance requirements for each credit. In addition the assessor will provide an information required schedule (IRS) which will confirm the documentation required for each credit. The design team will then have an agreed period in which to supply the relevant information to the assessor. Throughout this time, the assessor will continually update and re-issue the IRS to reflect the information received. The assessor will also be available during this time to provide support and assistance to the design team. Once all the information has been received/the agreed target has been achieved, the assessor will submit the D&P assessment report to the BRE for quality assurance and issue of the D&P (Interim) certificate. It is recommended that the design stage assessment is completed prior to the start of works on site or as soon as possible after works commence. 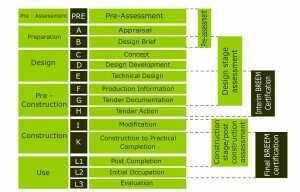 Whilst there is no formal BREEAM construction stage, Peak Sustainability continues to offer support to the design team to ensure that, if not yet complete, the appropriate information is provided for the design stage assessment and also to provide ongoing advice with regards to the preparation and recording of evidence for the post construction review. The post construction review (PCR) is undertaken upon practical completion of the development. The main purpose of the post construction review is to ensure that the ‘as built’ development meets the standards committed to during the design and procurement stage. The post construction review starts with a site visit by the assessor. This visit can take 2-3 hours as the assessor collects photographic evidence of the various systems, materials and features of the development. It is recommended that the site visit takes place as soon after PC as possible in order to prevent credits being lost as a result of changes made by future occupants. After the site visit, the assessor will prepare a post construction information required schedule (IRS) which will confirm the ‘as built’ documentation required for each credit. The design team will then have a period of up to 12 weeks in which to supply the relevant ‘as built’ information to the assessor. Throughout this time, the assessor will continually update and re-issue the IRS to reflect the information received. The assessor will also be available during this time to provide support and assistance to the design team. Once all the information has been received/the agreed target has been achieved, the assessor will submit the PCR assessment report to the BRE for quality assurance and issue of the PCR (Final) certificate.